This week’s blog entry was written by guest author Annika DiNovi. Annika is a graduate of Whole Life Yoga’s teacher training program. She can be contacted at annika.dinovi@gmail.com. Last year I embarked on a wonderful journey, the Teacher Training program at Whole Life Yoga with certified yoga teacher and therapist Tracy Weber. As I began the program, I was excited to deepen my yoga practice and explore boarder aspects of yoga including philosophy, meditation, and the methodology of viniyoga. 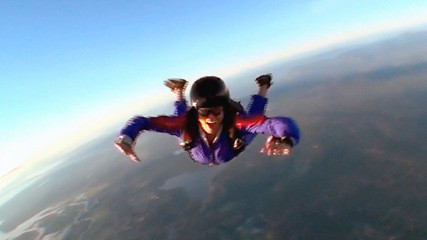 About 9 months into my study with Tracy, my husband and I went on a great adventure – we went skydiving! It was a beautiful Sunday, the sun was shining and summer was just around the corner. I clearly recall, prior to loading the airplane at Skydive Snohomish, a bit of hesitation and anticipation. “What was I getting myself into? !” I allowed the anticipation to turn into excitement – there was no turning back. And, excitement it was! What an experience – I still can’t find the words to describe the feeling – thank goodness my husband loved it as well. The following weekend we were both back at the drop zone enrolling in the program to become licensed skydivers – we were hooked! As we began the coursework, the first and most essential skill to master was the ARCH, this crates a stable surface for flying. The ARCH is practiced by lying on your belly, lifting your arms in a goal post position and lifting your legs both several inches off the ground. We practiced this countless times to build muscle memory. Our instructor jokingly said, “I hope you’re good at yoga, you might be sore.” Little did he know – this was yoga! We were practicing cobra in preparation to fly – I couldn’t believe it!! This has been a remarkable year; Tracy’s teachings have encouraged my growth in many ways. In reflection, I’ve learned that life is too short not to enjoy it. Allow yourself to grow, allow yourself to be challenged in new ways both on and off the mat and share your experiences with others. Hope to see you on the mat soon – if I’m not there, I’m in the sky! This entry was posted in Guest Writers, Teacher Training, Teacher Training Graduate Stories, Viniyoga on October 29, 2012 by Tracy Weber. Article on Viniyoga for Back Pain–Complete with a Practice! Articles touting the benefits of Viniyoga seem to be popping up everywhere (and that’s a good thing!). One of the newest examples is an article called “Watch Your Back” in Yoga Journal. This article talks about Viniyoga’s proven benefits in reducing back pain. Specifically, it discusses the Group Health study on Viniyoga for low back pain and shares the personal case study of a woman who healed her back using Viniyoga. The student, Terri Stoeker, has a back pain story much like my own. Like Terri, my back injury cane “out of the blue,” though it had likely been building for quite some time. Unlike Terri, I suffered for years–seven to be exact. During that time, I tried a number of methods for healing: physical therapy, acupuncture, muscle relaxants, anti-inflammatory medication, osteopathic manipulation, counseling on pain management, ice, rest, and massage therapy. At one point, I even said that I’d dance naked around a witch doctor’s fire if that would help. The one remedy that healed me, after seven years of failed experiments, was Viniyoga. Terri’s relief came quickly. Mine took a bit longer. But after seven years of pain, a few months to get relief seemed like nothing. In fact, since my doctors and I had already given up hope, the fact that I healed at all is nothing short of a miracle. I’d like to share two of my favorite quotes from the article with you. The second is from my teacher, Gary Kraftsow. The article comes complete with a yoga practice that may help decrease back pain. But be forewarned, the photos are misleading. In fact, they only show part of each position. The movement between positions is vitally important in Viniyoga. So I highly recommend using the text to guide your practice, rather than the photos. Better yet, sign up for my Yoga for Healthy Backs class! In the mean time, read the article, and tell me what you think! This entry was posted in Asana, Therapeutic Yoga, Viniyoga, Yoga Research on October 22, 2012 by Tracy Weber. I woke up Thursday morning actually looking forward to the 30-minute drive to my Mercer Island vet. No, I don’t enjoy I-90’s rush hour traffic, and although I love my vet, I wasn’t giddy with joy at putting my dog, Tasha, through yet another exam for her most recent slate of health issues. I wanted to see the trees. Seattle’s had an unusually gorgeous fall this year. The trees are turning color, and the ivy has become my favorite shade of red. Tasha’s vet appointment provided the perfect excuse to explore the fall colors before the weekend’s forecasted rain. I loaded Tasha into the car, turned on the radio, and set off on my journey. Five hours later, it occurred to me. I hadn’t seen a single tree. No, they hadn’t all mysteriously disappeared, transported to the planet Adrastea by mysterious alien aircraft. I’d simply been too distracted to notice them. I don’t even know for sure what distracted me. I wasn’t particularly stressed about this appointment. Traffic was a breeze for once, so I wasn’t worried about being late. I’d even had a good night’s sleep the night before. I suspect I spent the entire drive grumbling at my dashboard, annoyed by the political talk show I’d turned on—always a good use of my time. But regardless of the reason, I totally missed the colors, in spite of my intention to look for them. On BOTH directions of the drive. Which made me wonder. How many other beauties do I miss in my daily life even when I intend to look for them? According to The Yoga Sutras, the primary goal of yoga is to control the random fluctuations of our minds so that we can see clearly and react appropriately. In short, yoga teaches us how to be present in every moment—fully appreciating the beauty of this life, while not being derailed by its inevitable challenges. Even if one of those challenges is an obnoxious talk show host. I invite each of you to be fully present at least a few minutes each day. Turn off the TV and the radio. Silence your cell phone. Don’t check Facebook for an hour or two; your “friends” will still be there later. Unplug from your fast-paced technological life. Take in your surroundings; smell the scent of fresh rain. Communicate with the real friends standing next to you. I started Thursday afternoon by taking Tasha for a two-and-a-half hour walk. She joyfully immersed herself in all of her favorite fall scents. I finally noticed the trees. This entry was posted in dogs, Yoga Philosophy on October 15, 2012 by Tracy Weber. There are four letters that precede E that may get ignored. B is for Breath. Connecting the breath to the movement, to me, draws me out of the head and deep into the body and the yoga practice. I begin to lose myself and find my Self. Breath seems to bridge body to spirit. Pranayama–breath regulation–is a profound but underappreciated limb of yoga. comparing ourselves to other students or judging the teacher? When I studied at Oneness University in India, there was a big focus on devotion to the Divine. It was humbling for me to see that I was really more into ego and control than surrender, trust and a devotion to the Divine. Whether you define this devotion as one to your Higher Self, God, Universal Intelligence or whatever, I suppose that all paths eventually lead there even with our egoist detours. Indeed, we need look no further for the Divine than within our most sacred, essential Selves. E also stands for Enjoy, so let’s enjoy this beautiful yoga journey together! This entry was posted in Asana, Breath, Guest Writers, Meditation, Teacher Training Graduate Stories, Viniyoga, Yoga Philosophy on October 8, 2012 by Tracy Weber. Cakravakasana (also called “Cat”) is often confused with a yoga pose called Cat-Cow. Although the two poses look similar, they have completely different effects and intentions. For most students, Viniyoga’s Cat is much more beneficial than Cat-Cow. So much so, that my teacher calls it the “un” Cat-Cow. According to Gary, approximately 75% of Americans have increased thoracic kyphosis. Put in English, we have upper backs that are already too rounded. This happens primarily because of the activities we do in daily life. We sit in chairs, type at computers, drive cars, and do other activities that leave us in a hunched forward position. To balance that, our yoga practice should strengthen and flatten our upper backs as well as stretch the fronts of our shoulders. On the other hand, most of us have tight and weak lower backs, with increased lumbar lordosis. Meaning our lower backs are weak, tight and overly arched. To balance this, our yoga practice should both strengthen and stretch our lower backs as well as strengthen our abdominal muscles. Below is a photo of a student doing the pose most people call Cat-Cow. In the position on the left, she arches her low back in the “Cow” position. In the position on the right, she rounds her upper back in the “Cat” position. This increases the curvature of both her upper back and lower back—exactly the opposite of what most students need. In the two photos below, the same student performs Cakravakasana. In the position on the left, she uses her abdominal muscles to support her low back while drawing her shoulder blades together to flatten her upper back. In the position on the right, she gently pulls in her belly while folding her hips toward her heels, gently stretching her low back. For most students, the two positions of Cakravakasana effectively work together to restore balance to the spine and release back tension. Cat-Cow, on the other hand, may contribute to spinal imbalance and even increase back pain–even if it feels good while you’re doing it. Come to hands and knees, placing your hips directly above your knees and your hands slightly in front of your shoulders. Your knees should be at least four inches apart, and your hands should be slightly wider than your shoulders. On inhale, draw your shoulder blades together and lengthen your spine, keeping your belly lightly pulled in and your chin tucked slightly down. Do not allow your lower back to arch or your hips to move beyond your knees. On exhale, contract your abdomen while moving your hips toward your heels and your forehead and elbows toward the floor. Notice the gentle stretch in your lower back. On the following inhale, return to the hands and knees position in step 1. Cakravakasana is a gentle pose you can use to release tension and stretch your back any time of the day. I hope you enjoy it! This entry was posted in Asana, Therapeutic Yoga, Viniyoga on October 1, 2012 by Tracy Weber.